Chelsea flower show is the king of the flower shows and is the highlight of the horticultural calendar, but if you've never been, what is it actually like and does it live up to its hype? The Royal Horticultural Society's annual Chelsea Flower show took place this year from 19 - 23 May on the Embankment at Chelsea, hosted in 11 acres of grounds of the Royal hospital. I've been to the Chelsea Flower show once before, in 2007, but on that occasion I went on one of the public days. The show had crowds like you wouldn't believe! While this certainly added to the atmosphere, giving the show a really impressive feeling, it certainly detracted from the whole experience. So much so that I vowed never to go back, considering it a rather expensive and costly exercise to trip down to London for a day, battling with the crowds and 40,000 other visitors just to get an elusive glimpse every now and then of a show garden. So why did I return? Simple really; on behalf of the PlantAdvice.co.uk website I managed to secure press tickets for the Monday, the day before the show officially opened to the public. What a difference! An altogether much more pleasurable experience. Only this time, instead of fighting through the thronging public, I had to battle with film crews and celebrities. Thankfully they don't throng anywhere near as much as the general public. So, what was the show actually like, apart from spotting all of the celebrities like Rolf Harris and Joanna Lumley? If there were a central theme to the show, it would probably have to be centred around gardens promoting the growing of your own fruit and vegetables and herbs. This may have something to do with the present economic climate, with some enterprising soul even calling their show garden/vegetable patch Credit Munch! The show gardens were impressive as you'd expect, although to me they didn't have the same edge, or that little extra panache that they did when I last went in 2007. This could be that my personal taste didn't align as well with this current raft of gardens, as they certainly seemed to collecting the highly prized RHS medals. There are the usual array of stalls selling everything from a pair of garden gloves to greenhouses to rival Wembley Stadium. The flower marquee was very impressive and is always a welcomed place to shelter and take refuge when the typically inclement British weather arrives. In conclusion, I would have to say that I was a little disappointed with Chelsea this year. On balance, I think I prefer the Hampton Court show to Chelsea. Chelsea may attract the celebrities and the TV crews, but it makes it seem a bit of a circus show instead of a gardening show. Hampton Court doesn't attract the same celebrity or media attention; obviously not the cool place to be seen, but there again it is a gardening show. Hampton Court (33 acres) is much larger than Chelsea, there's more to see and you won't feel jammed in like cattle. Getting to Hampton Court is also much easier for the majority of us, compared to Chelsea, which is right in the heart of central London. So, if you don't like crowds, I would definitely go against the conventional wisdom and recommend the Hampton Court flower show over it's posher cousin Chelsea. That being said, I did enjoy the show, and if you've never been before it's well worth experiencing it first hand. 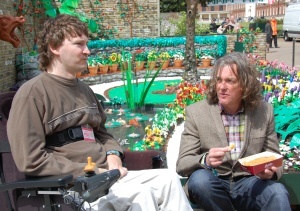 The highlight for me was sharing James May's chips; what a nice man. If nothing else in plasticine garden was edible, at least his chips were. Published on 20 May 2009 and Filed under Reviews.